The many signals sent between your brain and body are the reason you’re able to speak, walk and interact in any way, shape or form with your environment and those around you. These signals are carried back and forth by your nervous system. When you have a misalignment in your spine called a subluxation, it interferes with your nervous system’s ability to be the bearer of messages, leading to a decrease in your function. Many of our patients come to us in extreme pain. We’ll gather all the necessary information to determine if your problem is something we can help with and how long it will require to diminish or disappear. Once you’re out of discomfort, we’ll space out your visits, recommending regular checks now and then to ensure your issue doesn’t recur. 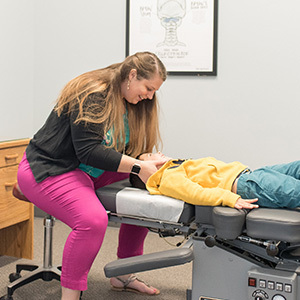 Dr. Alyssa may recommend additional modalities such as electric muscle stimulation or ultrasound, as well as exercises that can improve your condition. Every person is unique. Some of our patients see results within a single visit, while other problems that have been present for years may take longer. There are many techniques Dr. Alyssa has trained in using and will select what’s best for you, tailoring her approach. If you haven’t been to a chiropractor before and feel unsure of what to expect, know that we’ll walk you through the adjustment before starting. We’ve done our homework with thorough testing and X-rays and know exactly where to adjust. If you hear a sound during the adjustment, it’s completely normal and no cause for concern. Rest assured that chiropractic has been around for many years and has helped countless people. Contact our Center Point office today to find out! Same-day appointments are available for emergencies.